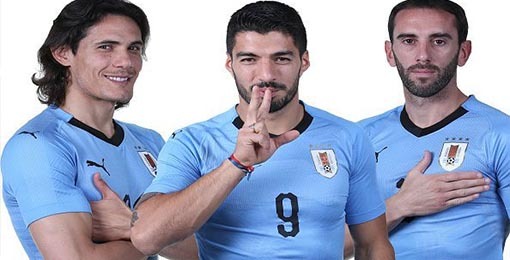 If you want to buy cheap uruguay shirt for 2018-19 season, buy it here in cheap-football.com , Check our exclusive range of uruguay Football Shirts / Soccer Jerseys and Kits for adults and children at amazing prices. Get the cheap uruguay jersey shirts, soccer kits with wholesale price, Free Shipping Worldwide! Uruguay national football team represents Uruguay in international association football and is controlled by the Uruguayan Football Association, the governing body for football in Uruguay. The Uruguayan team won the 2011 Copa America. They have won the Copa América 15 times, being the team that has won the tournament on most occasions. The team has won the FIFA World Cup twice, including the first World Cup in 1930 as hosts, defeating Argentina 4–2 in the final. They won their second title in 1950, upsetting host Brazil 2–1 in the final match, which received an attendance higher than any football match ever.They have won the Gold Medals in football at the Summer Olympics twice, in 1924 and 1928 recognized by FIFA as World Championships, before the creation of the World Cup. Uruguay also won the 1980 Mundialito, a tournament among former World Cup champions. In total, Uruguay have won 20 official titles, a world record for the most international titles held by any country.